The lack of analysis and breakdown of patch notes is still an issue. But we here at VainRank are dedicated to solving and helping out this issue one patch note at a time The patch notes are titled Enter The Bots, but we believe a better name is CoolDown in The Summer or Thank You SEMC as a lot of the changes are bringing a lot of Cooldowns and a lot of stuff the community has asked SEMC have been answered. Right at the top we learn some general information which we will discuss in detail below. However, something caught our eye while reading it. Samuel. He is mentioned as “the next new hero, the spell-slinging dark mage Samuel, will hit in 1.21. Awww another update without a roamer who’s actually best at Roam position. As many players will know, sunlight was actually very hard to gain as a lot of matches would be finished in under 15 minutes which would lead to no sunlight gained. You had to actually delay taking the vain until 15 minutes to gain sunlight. Thankfully, it has been decreased to 10 minutes for Ranked and Casual, 7 minutes for Co-op Bots, as well as gaining sunlight when losing BR. This will help a lot of players actually gain sunlight when playing correctly and winning the game. Although some matches will be finished under 10 minutes, the number of matches finished under 10 minutes and under 15 minutes is an enormous amount which will help a lot of players in my opinion. So Bots got a huge change this time around which is probably the reason they gave the notes the name Enter The Bots. Bots are being added to help new players as they will slowly but surely teach them so that they learn and improve skills like tactical commands, rallying, and social pings. Another benefit as the patch notes say is for mentoring players that are just beginning. Bots By Choice is probably meant for players to help remove the saltiness. Woot!!. Sometimes we can lose a lot in the game so we tend to explode on other players. With Bots learning to play on par with your skills, this would allow you to play with Bots until you get back into the mood to play in PvP matches. Bots can also be an excellent way to test and experiment new builds, heroes, mechanics, ideas, comps. So use the bots wisely and learn as much as you can and test em as much as you can. Our advice would be to use all items and heroes in Bots with your guild mates to actually learn them best before risking your ELO. In this section, we also got to see the new menu which looks amazing. Hype!!!. The only change here is having the new announcer for Double Kill and Triple Kill. What I find to be funny is that a picture of Vox was put up there knowing how powerful he is but still he is given a buff to help him get those kill streaks. Thank You SEMC!!!. Finally, we have a punishment for AFK, Rude pings, trolls, dodging, and negative karma. Yes Indeed! Karma will now serve a great function. In this last patch, we saw a change to how many votes you needed to get banned and lower you karma leading to a lot of players actually playing as intended. This system will place you into a low priority queue which will cause you to be having longer matchmaking times for a set number of matches. Not knowing how many more matches till you go back to High Priority Queue is the real torture. HAHA!! Every time you make more offenses you get more and more matches added and higher Queue Times. As you start playing better and better, the system will bring you back to good side. Once again THANK YOU SEMC!! This jungle monster will be replacing the medic and will be playing a similar role. He will give a heal projectile to the hero who made the last-hit. The heal will act the same as before, but will make it a little clearer to the beginners in the game. 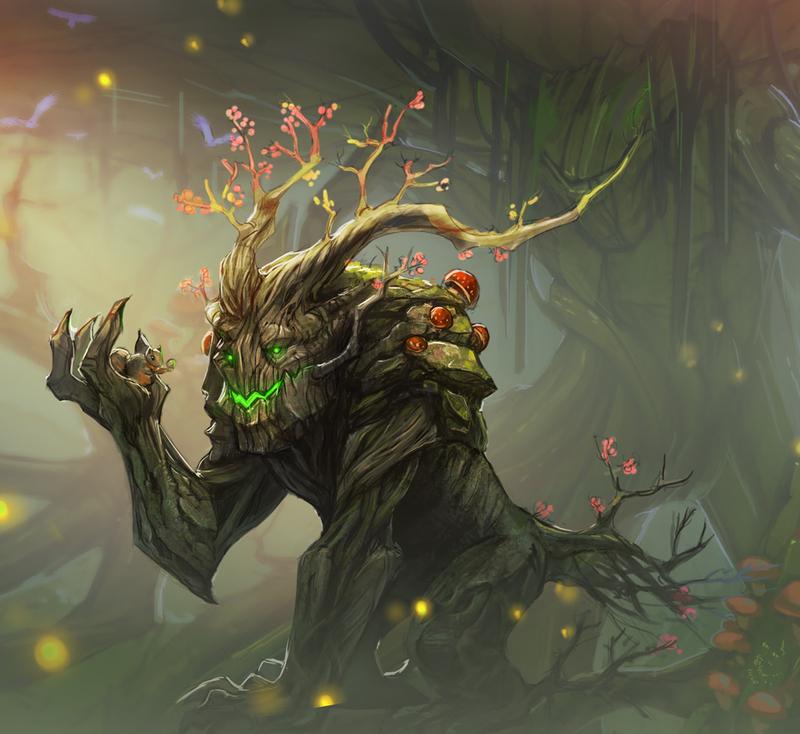 Treant camps will have less experience as well, making it so you have to kill all four camps to get level 2. The changes to the menus although look fascinating, i believe a better method would have been to eliminate the drop down menu as it can sometimes cause confusion. The best method might have been just to create buttons which you can see them at all times without having to open the drop down menu. For example right now opening the menu will let you see Battle Royale, Casual, or Ranked in buttons and you can pick. Finally, having the ability to pick any tag and not spend hours on finding an available tag is coming. To the new Teams and Guilds being created you can make whatever tag you want. However, the existing teams and guilds will have to wait till 1.21. Update 1.21, will be the highlight when Off Meta Gaming guilds finally get tags that actually make sense. Thank You SEMC!! A bunch of new quests have been added for playing heroes but now opening up to you being able to play any hero depending on what type of hero they are. They can be Warrior, Protector, Assasin, Mage, or Sniper. Now you can do it in any game mode. New quest types were also added as well like playing in bot mode. Quests now also can be completed in any game mode. This is being done i believe because some players just are not good at some heroes. So players who have trouble playing a hero like Krul, don’t need to spend so many game playing him to actually win with him. Thank You SEMC!! Experience distribution has changed once again so that now it is less likely for the Jungler to be a higher level than the Roamer. Now with the distribution being 65%/60% as opposed to the current 85%/40%, this means even less reason for people to go crazy and rage quit when a Roamer accidentally takes a jungle minion. Now there is more reason to share the Heal minions and hit the power spikes. Once again, it is key to understand that if a Jungler is soloing the Jungler he gains 100% of the XP, so it can actually be much more helpful to allow him to solo jungle to be hyper leveled much faster. However, the cost of this is losing 25% of XP as 65+60 is 125% of XP. However, the benefit of getting your Jungler hyper leveled and getting an increased of net gold for the team by staying in lane more may become the new meta. The best option would be to rotate down once your Jungler is coming to shop so you can go help invade and rotate back up once your Jungler is going to take your Jungle. Moving the MiniMap will now require Tap and Hold rather than just instant tap. This is for when you are just looking at the map for a quick instant will now require a hold. However, if you liked the old way SEMC has included the option for you to use that as well in the settings. Rage pinging indeed did drop a lot this last patch; however, it did hurt the players who actually used them correctly. Now it will be a slight change to possibly allow players who use it correctly to be able to do so and still restrict rage pinging a lot. Thank You SEMC!! Although Petal was already an amazing hero, her changes were made to help her gameplay be easier than before. For some players, playing Petal was a little more difficult than intended. Her overall Energy changes cause her to use energy on all abilities and her energy regen going down will make having energy items on her very crucial. Munions: Although a nerf to their health, a slight buff early game buff to their armor and shield may be a great change for Petal’s munching munions. Trampoline: Now this ability won’t require you to place a seed with your A ability and also can be used to jump in any direction. It also won’t recall your munions allowing you to keep putting on damage while chasing or kiting. This will cause petal to be an even better chaser, kiter, overall domineering potato The only downside being it will cost some energy, as compared to before where it cost no energy. Spontaneous Combustion: The ability to explode one munion at a time is an amazing change as sometimes you would waste all munions just to get an enemy getting away with a small amount of health. This also will allow great Petal players to be able to choose whether to focus all 3 charges on one person or split them. Basically, they realized Blackfeather is so broken, let’s try evening the playing field by breaking Petal the same way. HAHA. Heroic Perk: Whenever dealing damage with an ability she will be faster for 4 seconds but the cooldown reduction from basic attacks is now gone. Instead to replace this part of the perk they have reduced the cooldown across the board on all her abilities. Pouncy Fun: has gotten a great change with a drastic cooldown that will make it a much better ability as well as a 20% CP ratio increase making her more deadly as the match goes on and more CP is built while slightly lowering early game but increasing late game. Twirly Death: Currently Twirly death empowered her basic attacks depending on how many targets she hit which is why it was important to be able to attack minions and gain powerful basic attacks before jumping in a fight. Now she will gain 2 empowered basic attacks regardless of how many target are hit. The damage also got a 20% CP ratio increase while slightly lowering early game but increasing late game. The cooldown on this ability has been cut down to half allowing her to be much stronger. Yummy Catnip Frenzy: Cooldown brought down an enormous amount to now 80-65-50. This may cause a lot of players to no longer take the overdrive on her ULT and instead have the Cooldown with the items be enough as maxing her ULT provides no more incentive. Previously the Cooldown was brought from 110-80 from a level 2 to level 3. Now The level 3 cooldown is the same amount of time as her level 1. I believe this will cause a lot of players to begin taking the Overdrives on her B then her A. Although she was squishy, she wasn’t as squishy as she should be with her crazy amount of damage and healing. Her armor and shield went down in the mid-late game making her less of a threat as she will be taken down much quicker since she is squisher. Imperial Sigil: The changes are being made to hopefully cause Roam Lyra to be better than Carry Lyra. The heal has gained a 2.5% health ratio meaning the heal will be even larger now. However, the burst healing has been decreased to 8% from 15%. This means it will have to be used much more wisely if you want your team to get a small burst heal or a higher per second heal. Bright Bulwark: Easily the most broken ability this patch which could shut down so many heroes and it being more powerful as her second ability than Ardan Ultimate. This ability is getting a nerf its duration to a constant 2.5 seconds which means the need to time it right is very crucial. However, since it doesn’t last as long, the cooldown has gone down by a lot so that players can actually have it available more to change the way a team fight can go. Previously, enemies could also use the Portals to get out of the Bulwark but now they can not until the Bulwark goes down. Stormguard: Her bubble got the same change as Lyra B. She is now going to have a shorter duration of only 4 seconds with the bubble but the cooldown being much shorter as well. With the damage being raised slightly in the mid to late game. Gift of Fire: The burst heal CP ratio of Adagio was nerfed heavily from 65% to 45%, so that they can make him a much more Roam oriented hero. The burst heal now has an 8% health ratio like Lyra. This means the more health you build on adagio, the more he can heal. Agent of Wrath: A slight buff to make the amount of attacks that are buffed higher, but not enough to bring it back to where it may bring back to buff comps. I believe this ability will still require changing in the future as the nerf was just too hard to buff comps. Impale: The crazy amount of weapon ratio has been nerfed from 160% to 145%. However, I still believe Lance has an amazing amount of WP ratio for a Roam hero. This will still allow him to be such an amazing aggressive roamer and give Ardan a run for his money. Forced Accord: An increase to the late game damage on his Ultimate that may cause him to be able to keep up with the damage as the other roamers in the late game. As Phinn did typically fall off in damage wise as compared to other roamers. Winter Spire: Initial damage when it lands is going up a massive amount. Not only did the base damage go up but also a 20% CP ratio going up. The second form of damage from winter spire when it shatters has gone down in base damage and a 20% CP ratio. Basically, the damage distribution in his A has changed to make it a little easier to output damage. Personally, I liked the old way, it had to make you a better player mechanically speaking to know where and when to place the Winter Spire. Overall he is gaining an attack speed buff making it higher as he levels up. However, the worst part of Skaarf attack speed was his early game which didn’t get much of a change. The early game was when it was so hard to farm with which is what lead to the Swift Shooter first buy on Skaarf for so long. Fan The Flames: Now an increase of 1% CP ratio will help make Skaarf do a lot more damage especially to tanky heroes who build more health. Goop: The damage also got buffed over time as they walk on it and are burning. This will give Skaarf a much better late game damage. The one hero everyone was expecting a nerf, has in fact gotten a buff. Resonance: Although the base damage on bounces has dropped, meaning, his CP ratios have increased on the bounce damage 10%. This means he is much more likely to be doing more damage in the late game once he has his CP items built. This was to hopefully get players to get CP Vox to be a better choice as currently, WP Vox was just dominating the Fold. However, I still personally believe a lot of players will still be going WP Vox, as the gameplay difference is very much easier and also not a huge enough nerf to make people try to play the harder CP gameplay. These changes although will help CP Ozo a bit, it is nowhere near enough to get him into the top of the meta. Three-Ring Circus: The CP ratio on the first and third hit is now increased by 25%. This may lead to seeing more CP Ozo. However, I still believe WP Ozo is the way to go due to how hard he falls off late game as a CP hero. Acrobounce: Slight cooldown in the early and midgame. Again a change that may help his early game but the weakness of CP Ozo has always been his late game. Big Red Button: With Joule being such a great pick, this last patch due to her countering both Lyra, and Vox so well. This buff was unexpected but it is Summer so we all have to Cooldown. A cooldown on the Big Red Button that will make her Level 1 cooldown be at 60 seconds while the current Level 3 cooldown is 70. The change is huge that will let Joule have her ultimate much more available and will make her a devastating pick. Red Mist: The changes are being made to increase her fortified health up a good amount per second so that she can actually stay alive as she is practically a sitting duck while she is spinning. This will give her some defense to hopefully keep her alive. These changes were good to CP BF but I am left wondering why the buff to WP BF. Blackfeather was very powerful, the only reason he didn’t see much play was because Lyra countered him so hard. However, banning Lyra made BF still an amazing pick just as he was before in my opinion. Heartthrob: Currently having a 3-9(+7% CP) being changed to 5-10 (+10% CP) is trying to make CP Blackfeather more optionable. On Point: Damage increase for both CP and WP. The base damage did go down but the CP ratio gaining 15% and the WP ratio gaining 50%. This will help buff both WP and CP blackfeather. Attack of the Pack: Cooldown going down to a massive 90-75-60. Usually a good Fortress player was very cautious of using his Ultimate when only level one as it would be down for 2 minutes. However, even before the Aftershock made it so that Fortress had his Ultimate in almost every fight in the mid-late game. Now this is going to be even more likely that Fortress will have his ultimate. This may lead to players choosing to go Broken Myth instead of Aftershock for their one damage item on the roam. Add that on with the Stormguard banner changes. Fortress is also going to be a powerful damage dealer in the new patch. Kaku: No longer able to be used when stunned. Now a lot of items will be able to be used while using abilities that take a small amount of time to activate. The Stormguard banner is once again going back to its original way of doing damage with a much lower cost. The current SGB required using an ability and in the next 3 attacks in 6 seconds would deal a good amount of damage. Now it will deal a smaller amount of damage but on every basic attack. It granted 150 energy and 2.5 energy recharge. However now it will give a 30% cooldown speed, 4 energy recharge and 200 extra health. This leads me to question if the change is also going to make the tier one item that builds into stormguard change from Energy Battery to Hourglass. If it is still the Energy Battery will these new stats get added to the current energy stats. These stats are going to be a huge change to Roaming as a lot of roamers would love to not only gain health, energy, but a whopping 30% cooldown. The changes can be summed up to saying the Stormguard Banner changes is going to make this item finally be something useful and worth the money. However, the question is will the price of Stormcrown go down from 2200 to 1950 since the Stormguard Banner price was decreased. The item that made me cry when i saw someone buying it last patch got buffed this time to having 2 charges with each charge resetting every 20 seconds instead of 18. The only reason that this is going to be a good item to get now is because of the change to Contraption. The changes to contraption that we have wanted for so long are finally here. No longer will it make a the team cry when someone buys a contraption. Now Contraption may allow a lot of heroes who have great kits buy Contraption so they can have their abilities up much quicker with a whopping 40% cooldown, while having more which is equivalent to Clockwork now. That means a roamer who usually bought a clockwork like Catherine, Phinn, and Lance will now most likely be buying Contraption. Finally the time for Contraption has come which will actually make having scout traps useful again. The contracts were to too weak which caused me to cry when i saw someone buying them as there were just much better options to go with. The protector contract was the one i would rarely understand but no one managing to use it correctly due to the difficult need to be positioned correctly. However i still think the contracts lack the big enough BOOM to make them stand out as they are basically going to be sold as they fall off very hard and very fast. Either the contracts need to be able to have recipes which let them improve or they need to have that big enough reason to say let’s waste the 300 gold. Now grants the barrier to all allies near you. No longer do you need to be closer to the ally you specifically want to protect. Projectile speed also increased allowing to protect at the right times. However, it still is going to fall off very hard. An increase of damage from 75 to 100 may be a little helpful, but it doesn’t pack the punch needed to make it worth the buy in my opinion. This was a contract that was bought the most which shocked me. I did not see why players would want this contract as the new Jungle/Roam playstyle didnt require the need for the heals from the contracts. The small change to giving 10 energy when an enemy is killed may be trying to help laners to have more of a room to be able to having energy. However, it is not enough in my opinion to cause someone to say ok i am going to leave my Jungler to Solo Jungle the first rotation and I will go to lane. Buying this contract early on is very unhelpful as it won’t help your clear time nor your damage or defense in the first jungle fight which can be extremely crucial to deciding the outcome of the match. Once again lacking that BOOM needed to use 300 gold on an item that will have to be sold. Now having a decreased 10% cooldown ratio will mean this will no longer be a good cool down item for Roamers. However, the change to it having a passive of 25% CP ratio increase allows CP heroes have a good usage of Clockwork. However, this may be too much of a CP ratio, as it may add an additional 25% CP ratio to some heroes who already have an insane amount of CP ratio making them much stronger and giving them cool down to use their abilities more. This item requires much more testing but that 25% CP ratio may cause it to be a very important and crucial items for CP heroes. The downside of it being that gone up 650 to 2500. This also means no more being able to buy Clockwork right from the start when having fun in Battle Royale. Increasing the cost by 100 and a little more Weapon power to help even out the numbers. This item simply got a change due to the enormous amount of players playing Double/Triple Weapon with Bonesaws. The weapon power has gone down half so it will have a slightly less amount of damage. It recieved a nerf from going from 7 stacks of 7% to 8 stacks of 6%. Although the total difference is only 1% which will allow the item to still be viable and still very strong. However, it is not such a huge nerf as some believe. Imagine the time it takes to get 7 stacks currently you would ahve 49% armor shred. However, now 7 stacks would give you 42%. Still this is an amazing amount of armor shred and i believe that Bonesaw and double Weapon will still be a great path to use. Especially since a lot of people will think that Bonesaw got a huge nerf, it may cause players to underestimate the item. No more being able to use the candy when nearby. However, am i the only Roamer that always accidentally clicks on the minion candy when i have no space while shopping and ending up not realizing how much gold i have wasted on it ;(. Should the change not also have been to prevent being able to be bought when you have full amounts of items.